This is my new 3971 journal I made yesterday 1 May at Tracy Moore’s journal making workshop at the Urban Craft Center in Santa Monica. The journal measures 3″ X 4″. Teesha Moore taught art journaling on Saturday and Tracy taught journal making on Sunday. It was really great to hang out with Teesha and Tracy and chat and make journals in Tracy’s class with 19 other students. Tracy is an incredible teacher with amazing energy and enthusiasm for making journals. The journal is entirely hand stitched. 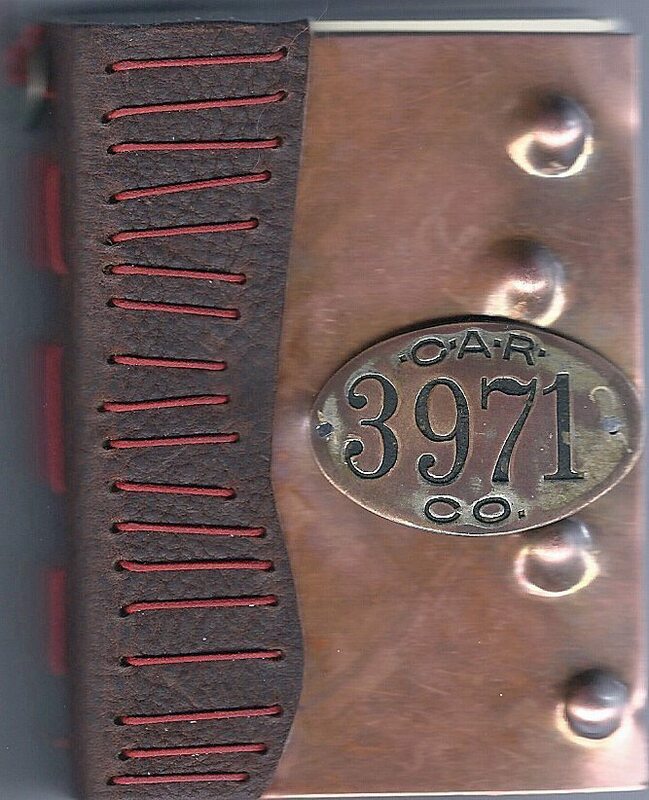 The 3971 Car Co. plaque is hand riveted to the cover. I found the plaque at the Long Beach swap meet at a cool vendor. I love the size. It fits wonderfully in my hand is the perfect size to put in your pocket. This is my second handmade journal with Tracy’s help. He taught me how to make my first journal during their PLAY retreat, you can view it here. Journal making is highly addictive and I can’t wait to make a really BIG one. I am hooked. Oh sooooooooo yummmy, ohhh I am so jealous, oh I want to make one like that, or two or three, different sizes. Such a tactile and raw and muscly experience it is to make a book like this. To look for the hardware, the leather, the metal, to put it together…labor of love…I made a tiny one like this under the tender care of Mr. Moore, and I loved it…it is now full of color, textures, and more yumminess, and I just love it…you lucky one!! Glad you had a fantastic time, this is one fantastic book you made there Mr. Brian. 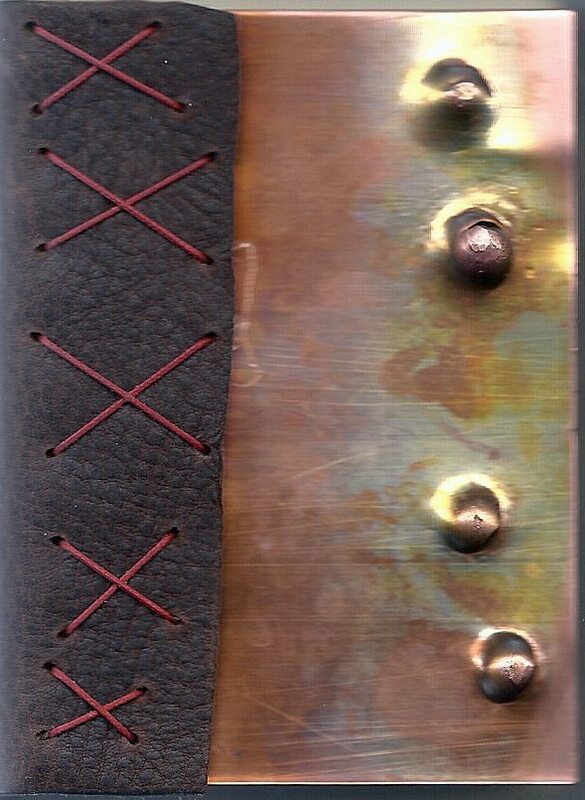 I love the metalwork on the cover and the button to tie off the binding threads on the spine is a GREAT touch =-) LOVE IT!!! What an awesome journal. I can guess you will cherish it and it’ll be even more special with your art in it. I’ll be interested to see you share the really BIG one you make on your blog. I love the 3971 plaque – what a great find! GET OUTA TOWN! that is a fabulous journal. I love your choice of color on the binding thread/floss. Nice contrast and really stands out and shows it off. What a cool journal. Sounds like you had so much fun making it. Lucky you! Love this journal. They certainly are addicting. Teesha and Tracy are both excellent teachers. I LOVE their classes.